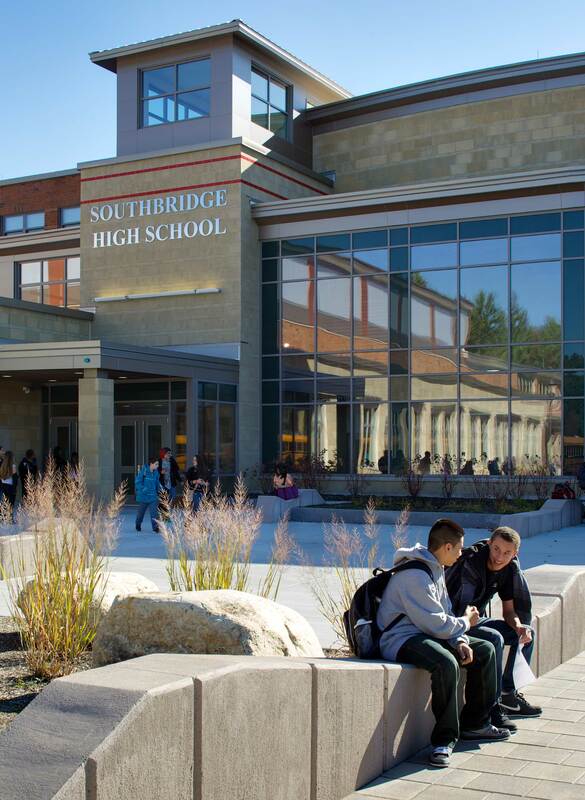 The new 1,000-student Southbridge Middle/High School is set up high on a hill offering inspiring views of the natural surroundings in central Massachusetts. This completely new facility replaces two outdated, overcrowded buildings on separate spatially-constrained sites. The new layout provides the developing athletic program with sports fields, tennis courts and a running track. The compact and efficient site design, including strategic siting of the building, was developed to protect, wetlands, streams, vernal pools and forests which in turn offer an outdoor learning laboratory. Outdoor activities are further encouraged with an outdoor classroom off the art room on the south side, and a dining area outside the cafeteria. Warner Larson’s work included all vehicular circulation, sports facilities, plazas, signage, lighting and landscaping.